In this article I described how we implemented client-side encryption in Roundcube using Mailvelope. There’s another approach for encryption, it is the Enigma plugin. It implements all the functionality using server-side GNUPG software. 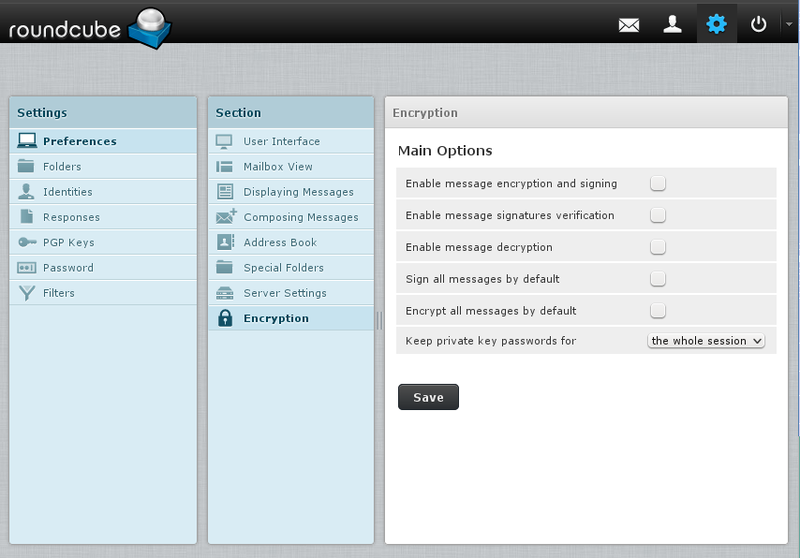 So, the big difference in these is that: Mailvelope keeps your keys in the browser, Enigma stores them on the server. In the current state Enigma however, has a lot more features. To use Enigma just enable it as any other plugin. Then in Preferences > Settings > Encryption you’ll see a set of options that will give you possibility to enable/disable encryption-related features. NOTE: As keys are stored on the server, make sure the directory used as a storage has proper permissions, and it’s good to move it somewhere out of the location accessible from the web (even if secured by .htaccess rules). Figure 1. Encryption preferences section. To manage your keys goto Settings > PGP Keys. There you can generate a new key pair or import keys. See the following screenshots for more details. Figure 2. Key generation form. Figure 3. Key information frame. 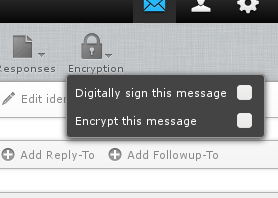 In message compose screen a new toolbar button is added with popup where you can decide if the message have to be signed and/or encrypted. The behaviour and the icon is slightly different than the one used for Mailvelope functionality. Also, note that we did not change the compose screen in any way, so all standard features like responses and spellchecking actually work. Figure 4. Encryption options in compose. You can find the Enigma plugin code in Roundcube 1.0 and 1.1, but only the version in Roundcube 1.2 (current git-master) is usable. I put a lot of work into this plugin and I hope there will be users that will use it. It depends on you if that solution will be extended with S/MIME or other features in future versions. Current state is described in the plugin README file . This is great work..been waiting for this..Is 1.2 Stable enough to upgrade to? We will have 1.2-beta soon. So, it’s a beta, but I’d say it’s quite stable. Development slowed down in last few months so, at the moment I do not expect serious issues.